Follow India's performance on Day 9 of the 2018 Commonwealth Games in Gold Coast, Australia. Hello and welcome to Day 9 of the 2018 Commonwealth Games. Tejaswini Sawant finished first in women's 50m rifle to grab India's first gold on Day 9. Anjum Moudgil took silver. And then 15-year-old Anish won gold in 25m Rapid Fire Pistol. Boxer Naman Tanwar though lost his 91kg semis bout and had to settle for bronze. 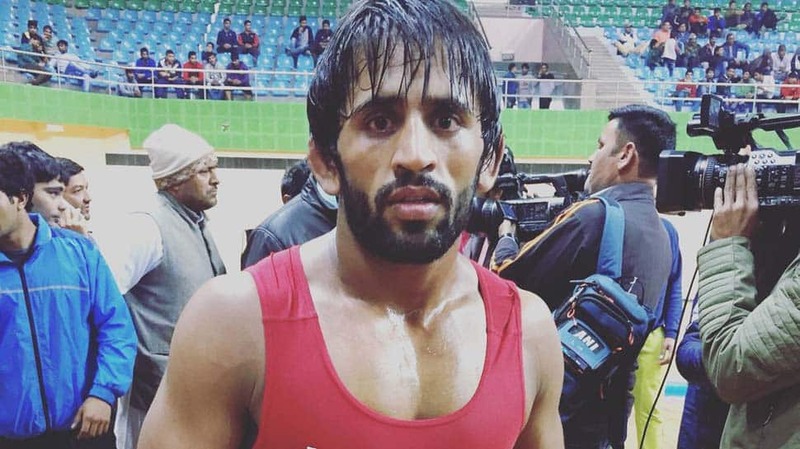 Wrestler Bajrang Punia won India's third gold of the day in the men's 65kg freestyle category. Pooja Dhanda had to settle for silver though after losing her 57kg wrestling final event. Divya Kakran won her bronze medal match to win another wrestling medal for India. Like Pooja, Mausam Khatri had to settle for silver in men's 97kg wrestling final. Later, India won another silver through the women's doubles team in table tennis involving Manika Batra and Mouma Das. In boxing, India's Manoj Kumar settled for a bronze after getting beaten in the 69kg semifinal. In the 56kg category, India boxer Hussamuddin Mohammed as he lost in the semifinal. Here is India's schedule on Day 9. As of now, India's medals tally reads 17 gold, 11 silver and 14 bronze. Click here for the overall medals tally. 1. Vinesh's last league match against Canada's Jessica MacDonald in the women's freestyle 50kg division with be for gold. She and Jessica have won their two respective matches so far. 2. Rio Olympics bronze medallist Sakshi Malik will be disappointed as she is out of the gold-medal race after losing two of her three league matches so far. 3. Sumit (125kg) may win gold without wrestling in the last league match as his Nigerian opponent Sinivie Boltic has 'reportedly' withdrawn due to injury. It's not official yet. Shooting: In the Men's 50m Rifle 3 positions qualification, kneeling and prone rounds are over and the final standing round is on. Sanjeev Rajput and Chain Singh in top three. Top eight reach the finals. Medal hopes Sakshi Malik (62kg) and Somveer (86kg) have won their respective opening matches in the wrestling arena. Also in progress is the women's hockey bronze-medal match between India and England, where it is 0-0 after 8 minutes in the first quarter. That's it now. Day 9 comes to an end and India won a rich haul of medals on Friday. India is still sitting pretty on the third spot on the medals table with 17 gold, 11 silver and 14 bronze. On Saturday, India will vie for a lot of medals and we assure you that we will keep you updated with all the good news from the Commonwealth Games in Gold Coast. And we have a little medical timeout here. Satish has struck Agnes on the face and he seems to have got a cut on the top of his eye. But the doctor confirms he is ok. After a minute, Satish is awarded the victory and the result says win by abandon. Satish struck a blow to the side of Agnes right eye and later a hook was enough to beat his opponent. The Seychelles team threw in the towel to abandon the fight. Satish moves to the final of the 91kg category. Back to the boxing arena now. The semifinal bout of the 91kg category has just started. India's Satish Kumar is taking on Seychelles Keddy Agnes. Satish is taller than Agnes and is using his reach well. But Agnes seems to be taking on the offensive. He is consistently landing punches Satish is defending well. Another good news from Badminton. This time India's singles player HS Prannoy has beaten Sri Lanka's Dinuka Karunaratna 21-13, 21-6 to qualify for the semifinals. Stay Tuned as India boxer Satish Kumar will take on Seychelles Keddy Agnes in the semifinal of the 91kg category in a few moments from now. India's mixed doubles team have won the quarterfinal against Malaysia. Ponappa and Rankireddy rally in the second game to ensure India's progress into the semis. Malaysia mixed doubles team is ahead 16-15 in the second game in the quarterfinal. Boxer Vikas Krishan has moved to the gold medal bout in the 75kg category by winning the semifinal. India are 9-11 at the break in the second game of the mixed doubles quarterfinal. Just out. India lose hockey semifinal against New Zealand 2-3. From badminton, India's mixed doubles pair have taken the first game 21-19 against Malaysia. Just Out. Another bronze here for India. Vikas Krishan wins bronze in the 75kg category. Krishan won on points. Manoj Kumar has won bronze after losing to English boxer Pat McCormack in the 69 kg semifinal. In the 75kg bout for Bronze, India's Vikas Krishan is taking on Steven Donelly. Lets see if he can add to the bronze medal tally. From hockey, India get another penalty corner. Let's see if India get this successful. And India has scored through Harmanpreet. India 2-3 New Zealand. From Badminton, India's mixed doubles pair of Ashwini Ponappa and Satwik Rankireddy are up against Malaysia in the quarterfinal. Here are some stats in the ongoing semifinal between India and New Zealand. The Kiwis have taken 5 shots at the Indian goal and have converted 3 out of them. India, on the other hand, have taken 13 shots on the opposition goal and have converted just one out of them. Back to the game. And India miss their 14th chance as well. This is poor hockey by India. This time Dilpreet's shot near the goal is blocked by the keeper. India still under pressure here. And India waste another opportunity!!! As Manpreet injected the ball, the Indians failed to stop it properly and the chance goes begging. A minute later, India once again miss another opportunity to score from close range. And there is another good news from Table Tennis!!! Manika Batra and Mouma Das have won the silver medal in the final of the women's doubles in Table Tennis. They lost 3-0 against Singapore. This is penalty corner for New Zealand!!! India referred the decision but the video umpire doesn't overturn the decision. After first drag is blocked by Indians, the penalty corner stayed with the Kiwis. And this time they don't miss the chance to add to their lead. Pr Sreejesh made a brilliant diving save to stop the dragflick but the mix up at the goalmouth cost India as the volley was struck in the goal. New Zealand get their third and India will have to work really harder. New Zealand 3-1 India. And another chance goes begging for India in the 6th minute. !!!! After SV Sunil showed skill with the stick to enter the circle, he passed on inside but the goal mouth melee meant India fail to put the ball in. India get a penalty corner in the 4th minute of the third quarter. Harmanpreet takes the flick but the Kiwis defend well as the defender uses his stick to deflect the ball. India lose the chance. Meanwhile, Sutirtha Mukherjee and Pooja Sahasrabudhe lose their women's doubles table tennis bronze match 1-3 against Ying Ho and Karen Lyne of Malaysia. Two big chances but the Indian team fails to make the most of them. They can't afford to miss these opportunities. New Zealand is a solid defensive unit, the Indians will have to keep that in mind. Ten minutes gone in the second quarter. India haven't conceded another and that's the only positive thing from their play so far. They need to score quickly to have a chance in this match. Second goal for New Zealand. Bad defending from the Indian team and Stephen Jennes scores in the 13th minute. Embarrassing is the word. India 0 New Zealand 2. The first quarter comes to an end. Penalty corner for India. But goalkeeper Richard Joyce gets in the way of Harmanpreet Singh. It is a fierce dragflick but the Kiwi goalkeeper is equal to the task. In the following goalmouth action, he stays firm. India and New Zealand begin their men's hockey semis. News coming from table tennis. Sharath Kamal and Sathian Gnaniansekaran reach men's doubles final after winning their semi-final match 3-1 against Singapore. They will contest England's Paul Drinkhaul and Liam Pitchford in the final. The English duo beat the Indian pair of Sanil Shankar Shetty and Harmeet Desai 3-0. Mausam Khatri loses 2-12 to South Africa's Martin Erasmus in the men's 97kg freestyle wrestling final. 10th silver for India. Overall, India's 38th medal. Eight medals today (3 gold, 3 silver and 2 bronze). Before Mausam Khatri takes the mat in the 97kg wrestling final, let us remind our followers here that Indian men's hockey team is also in action later today. It's the semi-final against New Zealand. We need not need tell you that if they win they will at least secure a silver. The match starts 3 pm IST. Stay tuned for Khatri's gold medal match. It will start in a while. Divya Kakran wins bronze after decimating Bangladesh's Sherin Sultana in women's 68kg freestyle wrestling. India's 12th bronze at the event. The country has won three gold, two silver and two bronze today. Pooja fought bravely but the Nigerian proved to be too good. The Indian, following the 7-5 defeat, has to settle for silver. India's ninth at the event. Another gold medal contest coming your way. Pooja Dhanda returns to contest Odunayo ADEKUOROYE of Nigeria. Can Pooja win India 18th gold? The match gets underway. She picks up the first point through a warning to her opponent. However, the Nigerian comes back and takes a 4-1 lead in the twinkling of an eye. Two more points for the Nigerian. Pooja is trailing 1-6. She has to do something special to win this contest from here. Bajrang comes for his gold medal match against Welsh Kane Charig. The first round gets underway. And he picks up two points. Two more. Four more. He is Yogeshwar Dutt's disciple. This is expected from him. He wins 10-0. 17th gold for India. Totally dominated the contest. Third gold for India today, in all fifth medal. India's overall medals tally goes up to 17 gold, 8 silver and 11 bronze. Nigeria's Amas Daniel stages a brilliant comeback in the last 10 seconds to win bronze in the 65kg category. He was trailing 2-4 before his comeback. Divya picks up her first point on account of a warning to the Nigerian. So far it's been Blessing dominating the match. Divya is finding it hard to escape her moves. She is on the brink of losing this match and she does. The Nigerian wins 11-1. Divya was no match for her opponent. No need to dismay though as she is still in bronze medal contention. She will just have to wait a little longer to know who her opponent will be. And it's Bangladesh's Sherin Sultana, who loses her match in the blink of an eye. Divya concedes one passivity point. She is up against a very experienced wrestler from Nigeria but she is doing her best. The 19-year-old concedes four more points. 5-0 in favour of the Nigerian after first round. Pooja will now play Odunayo ADEKUOROYE of Nigeria in the final. She is third Indian wrestler to reach a final today. Meanwhile, Divya Kakran begins her 68kg semis against Blessing OBORUDUDU of Nigeria. Tiako picks up points early in Round 2. 9-4. Pooja is taking her time, totally defensive. Just the right strategy. She concedes one point after being warned. It's over and Pooja is in the final, winning 11-5. Pooja begins well, picks up two points. Another two as she pushes the Cameroon player out of the orange zone. Great start by the Indian. Tiako comes back with a two-pointer of her own. Pooja leading 4-2. One more point for Pooja. Four more points and now Pooja is leading 9-2. The first round comes to a close. Here comes Pooja Dhana to contest her 57kg wrestling semis against Cameroon's Joseph ESSOMBE TIAKO. India's Vipin Kashana has also qualified for the Men's Javelin Throw final with a best attempt of 78.88m. He has joined Neeraj Chopra in the final. Chopra covered 80.2m earlier in the day. Guys stay tuned. Wrestling is going get underway soon. India could clinch a couple of golds medals. Bajrang Punia (65kg) and Mausam Khatri (97kg) are in the final, while Pooja Dhanda (57kg) and Divya Kakran (68kg) are in the semis. Second straight gold for Aussie Laethisha Scanlan in women's trap after scores of 38/50. Northern Ireland's Kirsty Barr takes silver with 27/50. Welsh Sarah Wixey take bronze at the age of 46. Shreyasi Singh gets eliminated after this round in women's trap. She needed to hit the last one to advance to the next round but she sadly missed. Goes out with scores of 19/30. Will be disappointed with her performance. Aussie Scanlan (17/21) and Welsh Wixey (17/22) have been brilliant so far. Shreyasi is now 14/22. She gets one more right, 15/23. 16/23 now, what a comeback by the Indian. One more hit for her and she is joint third. Scottish Sharon Niven, meanwhile, gets eliminated after 25 shots. Shreyasi Singh is falling behind, finding 12 targets in first 19 attempts. She has just got one right and now it's 13/20. She is facing elimination. Women's trap final begins. India's Shreyasi Singh is in the fray. Meanwhile, IOA says it will appeal the removal of two Indian athletes Rakesh Babu and Irfan Kolothum Thodi for breaching "no needle" policy. The third round gets underway. Street fight is on here between Naman and the Aussie. 70 seconds to go. Both are terribly tired but passion is still there. This is close. Difficult to say who has had the upper hand in this bout. The third round comes to a close. The verdict will be out shortly. And Naman loses the bout and settles for bronze. Naman is throwing punches from all sides. Landing is not as effective though. Still, he looks the better of the two. The Indian will be happy with his performance in this round. Naman starts well against the Aussie. Though he is a little careful today, not as aggressive as he had been in previous matches. Halfway through the first round, he looks in good shape. He slips in the last few seconds but appears fine. One can say that the Aussie came back a little towards the end. The first round comes to a close.